I am a bit nervous about it – I know how brilliant it can be as a concept and I really want this to work as well as it did at City but as with anything you can’t tell until it is well underway how it is going. I have to thank Emma Cragg, Laura Wilkinson and Rowena Macrae-Gibson for their advice and encouragement in getting this started – all their tips from their own experience was invaluable. I can only hope this goes as well as their iterations. The first week concerned blogging and RSS feeds. I used to think blogging was an indulgent frippery, all navel gazing and self-importance but have found that it has become a more and more essential part of my working life. Sometime things can be a bit introspective but I have also found the use of reflection as a learning tool has helped me a lot. 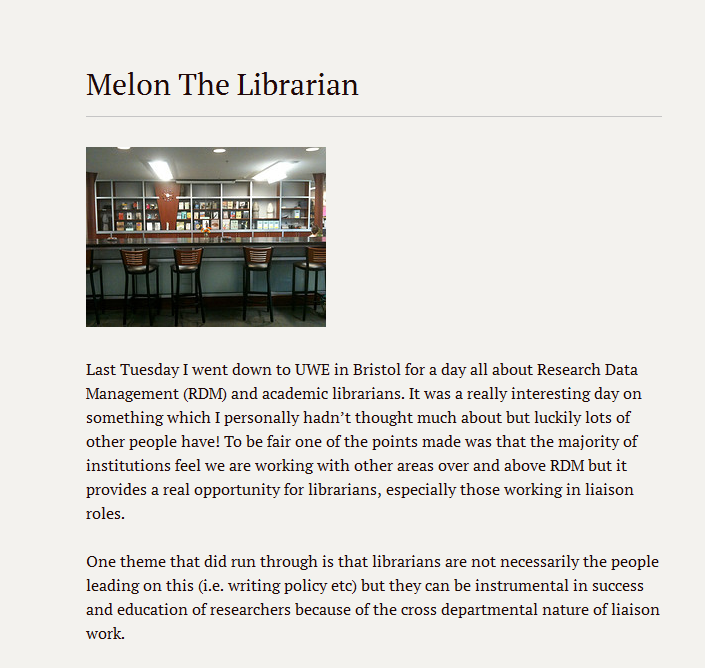 I’ve blogged before about professional versus personal in social media and RSS Feeds both posts say much of what I would say now in reflection on week one of RHUL23 – blogging saved my sanity two years ago after major surgery and gave me a different perspective on blogs. Couple that with the fact this blogging has helped me find an outlet for my film reviews as well as interact with my profession and I really feel a place for blogging.